The National Council of Churches in the Philippines (NCCP) stands with all people of goodwill in celebrating the 70th year of the Universal Declaration of Human Rights (UDHR) on December 10, 2018. The Declaration should be celebrated because it is a historical document that unites the core values of the community of nations in defending God’s gift of human dignity by ensuring the protection of every person’s inalienable rights. The defense of human dignity has always been the sacred task of people of faith. We, in our belief that humans are created in the image of God, have long stood for and actively taken part in the defense of life and human dignity and in advancing the cause of human rights. We also believe that the respect and promotion of human rights is a cornerstone of peace based on justice. The UDHR is critical because it has provided a common framework and standard for all nations and governments to follow. Unparalleled gains have been achieved since its adoption after World War II, yet the challenge remains to consistently push for the respect and defense of human rights in a world where there is a growing global trend to undermine it. For example, in the Philippines, the UDHR is enshrined in our Constitution through the Bill of Rights. We are also one of the first States to have ratified almost all of the core international human rights treaties currently in force. However, the human rights situation in the country has continued to deteriorate. A campaign against illegal drugs that has resulted in a death toll of thousands; the recent massacre of the Sagay 9; the killing of Atty. Ben Ramos, a well-known human rights lawyer in Negros Occidental; the suspension of peace negotiations and waging a total war against rebels and suspected supporters; and heavy militarization of indigenous people’s communities, are just a few examples that show a serious human rights crisis that is persisting in the country. The NCCP believes that one of the most viable solutions to avert this human rights crisis is the resumption of the peace negotiations between Government of the Republic of the Philippines (GRP) and the National Democratic Front of the Philippines (NDF). The GRP-NDFP peace negotiations does not only address the violations on civil and political rights and international humanitarian law but will also tackle the social, economic and cultural rights of the people by addressing the roots of the armed conflict. We thus appeal to both parties to immediately resume the formal peace talks. 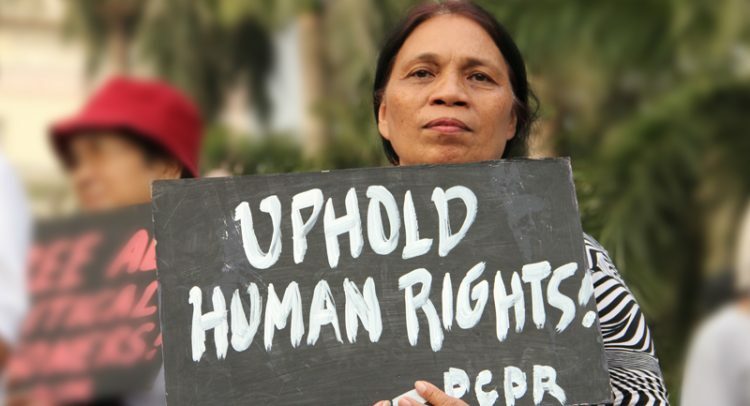 We also appeal to our lawmakers to enact the Human Rights Defenders’ Protection Bill, which is currently pending in the Lower House and the Senate. This bill will greatly contribute to the cause of human rights in the country and is a lasting contribution to the commemoration of the 20th year of the UN Declaration on Human Rights Defenders on December 9. The NCCP affirms what Jesus has proclaimed, that the “Spirit of the Lord is upon me, because he has anointed me to proclaim good news to the poor. He has sent me to proclaim liberty to the captives and recovering of sight to the blind, to set at liberty those who are oppressed, to proclaim the year of the Lord’s favor.”(Luke 4:18-19) The commemoration of the 70th anniversary of the UDHR is a reminder for everyone, especially for church people, that we must constantly be vigilant and act upon what our faith has taught us: that the respect and promotion of human rights can help in bringing about the good news of God’s peace. We thus invite our member churches to #StandUp4HumanRights.